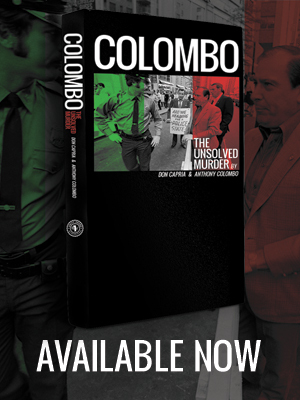 Colombo: The Unsolved Murder by Don Capria & Anthony Colombo – Available at Amazon, Amazon Kindle and Barns & Noble. On June 28, 1971 while standing within a crowd of fifteen thousand people, Joe Colombo was shot three times in the back of the head. Among the fifteen thousand people were herds of press, a swarm of uniformed cops, NYPD detectives and a team of FBI agents. Forty years later, the shooting of Joe Colombo remains unsolved. 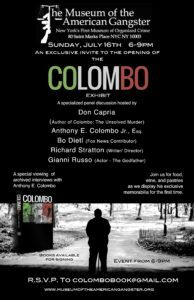 Author Don Capria reopens the investigation with compelling evidence that contradicts the popular belief behind Colombo’s death. With the help of Joe Colombo’s eldest son, Anthony, Colombo: the unsolved murder tells the story of how young Colombo rose to power, starting on the streets of Brooklyn to being named one of New York Magazine’s “Top Ten Most Powerful Men” in 1971, alongside Nelson Rockefeller and Mayor John Lindsay. Joe Colombo was known as the leader who claimed ownership of one of New York City’s infamous Five Families; and to many others he was the charismatic Italian civil rights leader who organized over a hundred thousand people to rally in Columbus circle in 1970. Now, Colombo: the Unsolved Murder unveils Colombo’s life and death with never before told stories from family, friends, associates, and law enforcement. After over forty years of silence, Anthony Colombo tells his firsthand accounts of life beside his father and the events that lead up to his fatal shooting in Columbus Circle. Find out why Joe Colombo was known as the most paradoxical man in organized crime and why the FBI worked day and night to destroy his name, family, and ultimately his life.